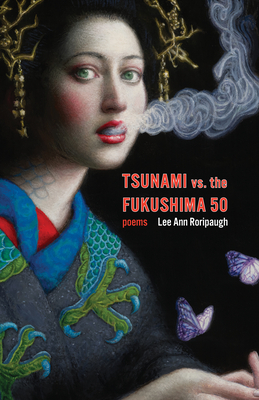 In tsunami vs. the fukushima 50, Lee Ann Roripaugh takes a piercing, witty, and ferocious look into the heart of the disaster. Here we meet its survivors and victims, from a pearl-catcher to a mild-mannered father to a drove of mindless pink robots. And then there is Roripaugh's unforgettable Tsunami: a force of nature, femme fatale, and "annihilatrix." Tsunami is part hero and part supervillain--angry, loud, forcefully defending her rights as a living being in contemporary industrialized society. As humanity rebuilds in disaster's wake, Tsunami continues to wreak her own havoc, battling humans' self-appointed role as colonizer of Earth and its life-forms. "She's an unsubtle thief / a giver of gifts," Roripaugh writes of Tsunami, who spits garbage from the Pacific back into now-pulverized Fukushima. As Tsunami makes visible her suffering, the wrath of nature scorned, humanity has the opportunity to reconsider the trauma they cause Earth and each other. But will they look? Lee Ann Roripaugh is the author of four previous collections of poems, including Dandarians. Her first collection, Beyond Heart Mountain, was selected by Ishmael Reed as a National Poetry Series winner. Her second collection, Year of the Snake, was named winner of the Association of Asian American Studies Book Award. Her third book, On the Cusp of a Dangerous Year, was lauded as "masterful" and a "gorgeous canticle" (Maura Stanton). And then most recently, her fourth collection of poems, Dandarians, was described as "a work of beauty and resilience" (Srikanth Reddy). Roripaugh has received an Archibald Bush Foundation Artist Fellowship, the Frederick Manfred Award from the Western Literature Association, the Randall Jarrell International Poetry Prize, and an Academy of American Poets prize. She serves as Editor-in-Chief of the South Dakota Review and directs the creative writing program at the University of South Dakota, as well as being the state's Poet Laureate. She resides in Vermillion.